Summit Racing Equipment is the world's largest mail-order, automotive performance equipment company with thousands of performance parts, aftermarket accessories, tools and garage equipment and stock replacement parts. For over 40 years, Summit Racing Equipment has set the standard for fast shipping, customer service, and technical expertise in auto parts to become a performance powerhouse around the globe. With headquarters in Tallmadge, Ohio, Summit operates distribution and retail stores in Sparks, Nev., McDonough, Ga., and Tallmadge in addition to a recently-opened 750,000-square foot facility in Arlington, Texas. Headquartered in West Palm Beach, Florida, the International Hot Rod Association (IHRA) is one of the world's largest motorsports sanctioning bodies. The IHRA promotes Sportsman drag racing for drivers of all levels. The IHRA sanctions nearly 100 motorsport facilities in the United States, Canada, Australia, New Zealand and the Bahamas and welcomes 80,000 racers annually to their IHRA-sanctioned facilities. 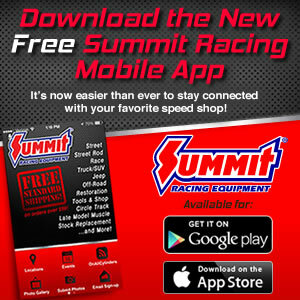 The IHRA oversees multiple Sportsman racing programs including the Summit Racing Equipment SuperSeries. For more information, visit www.IHRA.com, or connect on Facebook.com/IHRAMotorsports, Twitter @IHRA or Instagram.